Wilson's non wrap-around umpire mask replacement pads fit close for confident protection. Tan full-grain leather interior with poly outer shell is available in all tan or two-tone black and tan. High-performance, industry-tested face mask padding. Available in black and tan. 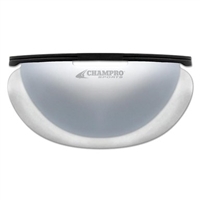 Made from lightweight steel, this throat guard was designed to fit and attach seamlessly to the Defender. Weighing a little over 3 ounces, the throat guard measures 3 3/8" wide and 5 3/8" long with the signature F3 logo built into the design, it's the perfect size to provide added protection. The body of the throat guard is curved to help prevent baseballs from sneaking up in between the throat guard and your throat. No throat guard can protect or guarantee total protection against those rogue baseballs. Give your gear a refresh with a Wilson Umpire Replacement Harness. This replacement harness features a neoprene triangular base that keeps you comfortable all game long behind the dish. Extra-long adjustable shoulder and body straps make the harness perfect for umpires of all sizes. 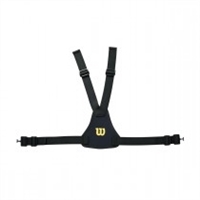 Designed for Wilson Pro Gold, Pro Platinum and Fitted Umpire Chest Protector, this harness is a must-have for umpires ready for the long grind of another season. Padded throat guard for comfort and great protection is available in both 4" and 6" lengths. Sports Tally & Pitch Counter This replacement shin guard strap fits most commercial umpire shin guards.